Last Friday, i spent the evening at the Arts Catalyst for the Kosmica sound night, a social event for artists, scientists and the cosmically curious exploring sound and sonification of space. That means drinks, crisps, pop corn, space music and presentations by curator and artist Honor Harger, sound artist and composer Kaffe Matthews and designer slash sound artist Yuri Suzuki. With Nahum Mantra as master of ceremony. I frantically took notes during the presentation, thinking i’d blog the talks until i realized that the Arts Catalyst was going to upload the video of the whole evening. So i’m going to merely point you to the videos: This way please! Now all i’m going to write down is a summary of the presentations, along with a few links to the projects, historical facts and scientific discoveries mentioned during the presentations. The first presentation was by Honor Harger. She is the director of Lighthouse, an arts agency in Brighton, UK. But she is also part of the artistic duo r a d i o q u a l i a together with collaborator Adam Hyde. 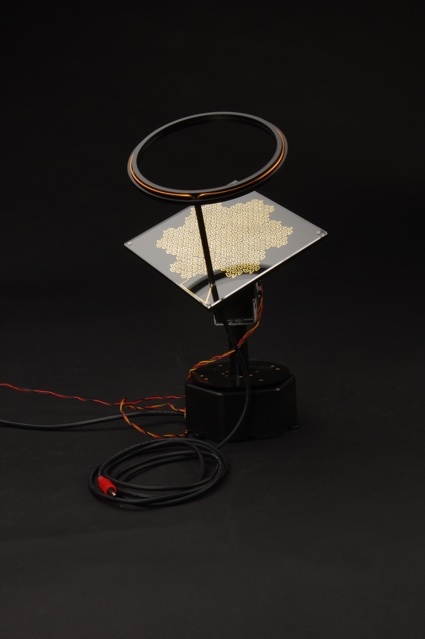 One of their main projects is Radio Astronomy, a radio station broadcasting sounds from space. And i don’t know how she does it but she also finds time to write a brilliant blog called Particle Decelerator. Honor’s presentation was an investigation into how we have used sound to gather information about space. We all have an idea of what space looks like. We’ve all seen images of it but what does space sound like? The story of the discovery of the sounds of space is intimately linked to the history of the telephone. From 1876 when Thomas Watson, the assistant of Alex Graham Bell, was listening through the wires to some strange sounds which corresponded in fact to activity taking place on the surface of the sun. To 1932 when Bell Telephone Laboratories engineer Karl Jansky was called to identify the cause of a “steady hissing” interfering with transoceanic telephone service. He correctly guessed that the noise wasn’t coming from Earth but that they were cosmic radio noise from the Milky Way. The final stop Honor Harger made in the history of Bell Laboratories is 1964 when two researchers detected a source of low, persistent noise in Bell’s antenna, the Holmdel Horn. It turns out that the noise was cosmic radiation that had survived since the birth of the universe. That was the first evidence of the Big Bang. Joyce Hinterding‘s electromagnetic installation Aeriology (1995) “aeriology”, a huge antenna that resonates to the VLF (very low frequency) section of the radio spectrum, and makes audible the crackle of spherics from the solar winds as they interact with the ionosphere and the background noise of the Milky Way, the energy emitted from stars. Honor also showed one of my favourite videos of 2011: 20 Hz. 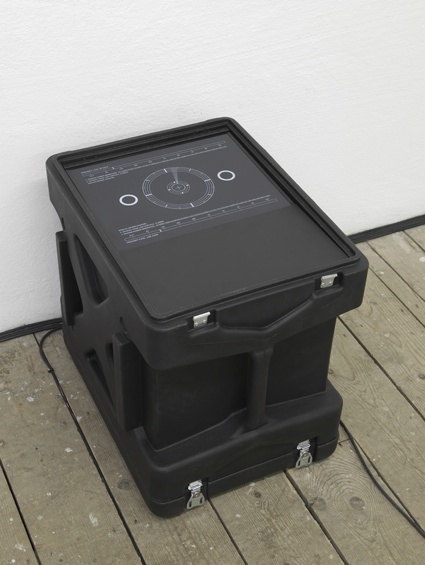 The work observes a geo-magnetic storm occurring in the Earth’s upper atmosphere. Working with data collected by CARISMA (Canadian Array for Realtime Investigations of Magnetic Activity), an array of magnetometers which study the Earth’s magnetosphere and interprets the data as audio, allowing us to hear the “tweets” and “rumbles” caused by the interaction of solar wind with the Earth’s magnetosphere. 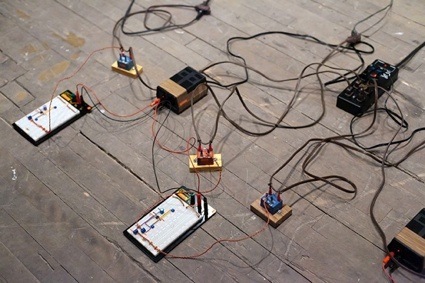 Caroline Devine‘s 5 Minute Oscillations of the Sun, explores naturally occurring radio signal and solar activity and alternates every five minutes between acoustic and electromagnetic “listening modes” that provide new ways to “listen” to the sun. Kaffe Matthews presented the work she created with Mandy McIntosh when they worked with NASA scientists and got to meet ex-astronauts to whom they asked “What is the sound like in space?” More about the project over here. The last part of her talk focused on the Star Gazer chairs, music and suits made to watch the star in the Galloway Forest, Scotland. The project was again developed with Mandy McIntosh and is called ‘Yird, Muin, Starn,’ which means earth, moon, star in old Scott. Yuri Suzuki brought us firmly back to Earth with The Sound of the Earth, a spherical record with the sound engraved on the surface of the globe. Each country on the disc is engraved with a different sound, collected by Yuri Suzuki during his travels or with national anthems for the countries he had never visited. During the last edition of Design Week, Yuri Suzuki drove a Sound Taxi around London. The vehicle was equipped with a microphone that recorded the noise of the city: traffic, screeching brakes, sirens, construction work, etc. 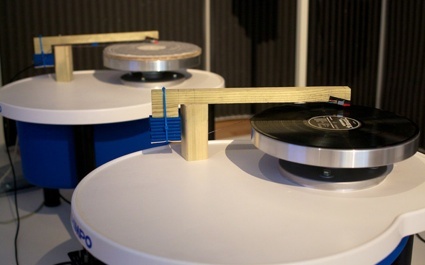 A specially designed software analysed the frequencies of these noises and used them to generate music in real time. His White Noise Machine calculates the quantity of street noise and then generates the same amount of white noise. The boxy design of the White Noise Machine was inspired that by the noise-generating devices that Italian Futurist Liugi Russolo built at the beginning of the 20th century. The videos showing children shouting at Suzuki’s White Noise Machine is hilarious. And with this i close my notes about Kosmica sound night. Posted in art in London, science, space, video. Bookmark the permalink.